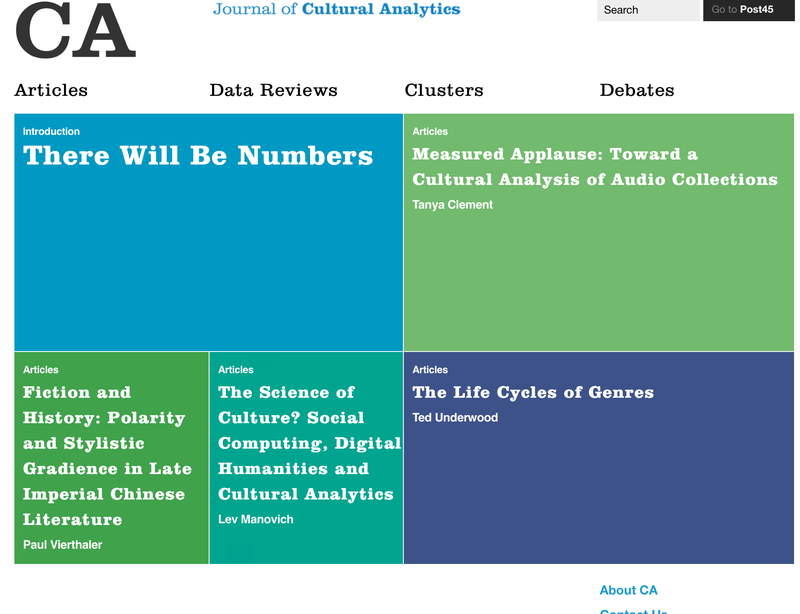 We have some exciting new material that will be appearing shortly in CA: Journal of Cultural Analytics, which I thought I would share here. The NovelTM research group will be producing a cluster on “The Novel and Genre,” with contributions from Ted Underwood, Matthew Wilkens, Matthew Jockers and Gabi Kirilloff, Matt Erlin, Andrew Piper, Mark Algee-Hewitt and his team Laura Eidem, Ryan Heuser, Anita Law, and Tanya Llewellyn. The aim of this cluster is to address how literary scholars have historically grouped novels, whether as subcategories like detective fiction, gothic fiction, white-male fiction, or as marketing devices used by publishers in the eighteenth century (the tale, romance, history), or as subject to different kinds of characterization, or even more fundamentally through the novel’s distinction from non-fiction. In each article, the cluster will explore how computational approaches can shed light onto the coherence and affinities between novels and between different kinds of groupings of novels. What does such a computational understanding of genre allow us to do and say about the history of the novel?